Just outside of Charlottesville, Virginia, lies Monticello, the gracious hilltop estate, designed by Thomas Jefferson, and his home for most of his life. The future president and author of the Declaration of Independence made the house and the estate his life's work, continually tweaking the designs and adding features. Constructed over a period of 40 years, between 1769 and 1809, Monticello showcases Jefferson's many talents. 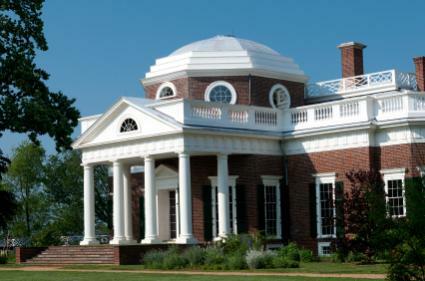 After returning home from his stint as the United States' ambassador to France, Jefferson revised the almost completed Monticello's design to reflect the Palladian style of architecture, popular in France. After Jefferson's death, his heirs were forced to sell the property to settle his debts. Monticello's main house has 39 rooms, divided among the cellar and three floors, and features around 11,000 square feet of living space. There are few furnishings in Monticello, as Jefferson preferred open spaces, yet his more unique inventions, including a dumbwaiter in the dining room and a seven-day clock, are featured in plain sight. He favored built-in cabinets and furniture, and most of the home's beds are located in specially-designed alcoves. Jefferson's suite of rooms, in the house's south wing, consists of his private library. The modified octagonal room once held over 6,000 books, but the works have since been sold to the Library of Congress. Because Jefferson was an outdoor enthusiast, the house has 13 skylights to help bring the outdoor light indoors. Jefferson's suite of rooms also features a greenhouse, a light and airy room where Jefferson kept tropical plants over the winter and started seedlings for the garden. Even the entrance hall floor is painted green, reportedly so that Jefferson would feel he was still outdoors when he entered the house. Connected to the main building via open-air passageways lined by columns are the large kitchen (kept away from the house so as not to heat the house during the summer months), the food storerooms, craftsmen's workshops, and the slaves' and servants' quarters. Also in this section is the small room where Jefferson lived for years while building the main house and to which he brought his bride, Martha, after their wedding in 1772. Thomas Jefferson was an avid gardener. He grew over 170 different kids of fruit trees in the orchard as well as extensive flower gardens and borders, featuring over 100 species of annuals, bi-annuals, and perennials. Jefferson kept copious notes and sketches about his gardens, and following these, the gardens have been restored to their former glory. The food at Monticello was well regarded, with the household growing much of its own produce in the 1000-foot long vegetable and culinary garden. Today, visitors can stroll among the well-manicured grounds and glimpse life as it must have been during Jefferson's time. In 1923, after Monticello had been sold privately a few times, the estate was sold to the Thomas Jefferson Foundation, which owns and operates Monticello today. It is the only historic house in the U.S. on the United Nations' World Heritage List. Visitors are welcomed on tours throughout the grounds. There are also films shown and exhibitions displayed that showcase Jefferson's influence on history. A visitor's center at the entrance to the property contains over 400 items once owned by Jefferson, as well as interactive exhibits about the estate. 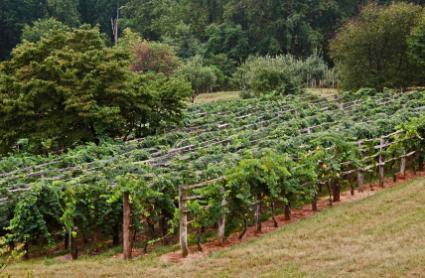 Also offered are kid-friendly tours, making this an excellent stop on a family vacation. Monticello is open every day except Christmas Day, and some of the tours require reservations. Plan to arrive at least 30 minutes before your tour reservation time to allow for the collection of tickets and boarding the shuttle bus. If possible, take in the 15-minute long introductory film before the shuttle bus ride up the mountain. Keep in mind that much of the Monticello experience is outdoors, so appropriate clothing should be worn. The best times to visit are June through September when the gardens are in bloom. Visiting during the annual July 4th Independence Day Celebration makes a visit extra special, but it is also an extra busy time for Monticello. Finally, the Monticello website features directions from all areas of the country, including Washington, D.C. It also features the physical address that can be used to search for directions via GPS. Directions from both MapQuest and Google Maps are included as well.